So, while I have been silent on the blog, I have been working hard on the design. Basically, Upper and Lower Bodies are done, only some few tweaks here and there to make all fit together. As you can see in the renderings below, the body shape is mostly the same but I fixed many issues from the previous body. These issues mostly came from the FFM 3D printing process (lack of precision and build volume and my beginner level in 3D printing at that time). The new robot will be printed with SLA process allowing more complex shape and better precision than before. The Lower body contains the battery, Motherboard and Control Interface. The upper body is composed of 2 parts which allows me much easier assembly and better reliability. The upper body will be constantly screwed to its lower counterparts and the Upper Cover (where most of the devices are placed) will be screwed on the Upper body. As you can imagine, this will allow me to access all the internal part of the robot without removing the legs (which is currently a huge problem on the Rev2), by simply unscrewing the Top Cover. The Head, Rpi, servos are directly mounted on the Top Cover, and connected by only 3 cables to the Motherboard for easy assembly/access. As mentioned, now Animabot is only composed of 1 motherboard instead of several which help a lot on 2 points: performance and compactness. The Power supply is based on a LM25119 from Texas Instrument and capable of delivering 2x 10A at 7.4V, that’s over 140W !!! The charger evolved as well and is now capable of Telemetry, I will be able to supervise the input and output energy of the Battery. The charger also takes care of the standard protections (over-charge, battery temperature, under-voltage, etc..) and all the monitoring/configuration is done via I2C ! I also over-dimensioned most of the components like the transistors to be sure to be on the safe side. I also removed the ATX Raspi from the robot and the Raspberry Pi will be controlled by the CortexM4 directly for powering ON & OFF. To avoid the last noise issue on the speakers, I added a small isolated DC-DC converter for the audio amplifier. As mentioned, all the sensors are now connected together on the same I2C bus, which should improve and simplify the data acquisition (one function to gather all sensors data). The IR telemeter as well, I use a small I2C ADC converter to do the trick. I’m currently working a bit on Animabot’s software (Raspberry Pi side). I developed a small application for the Head Tracking which will be used on the robot. The application is developed in Python and using TkInter for the GUI. 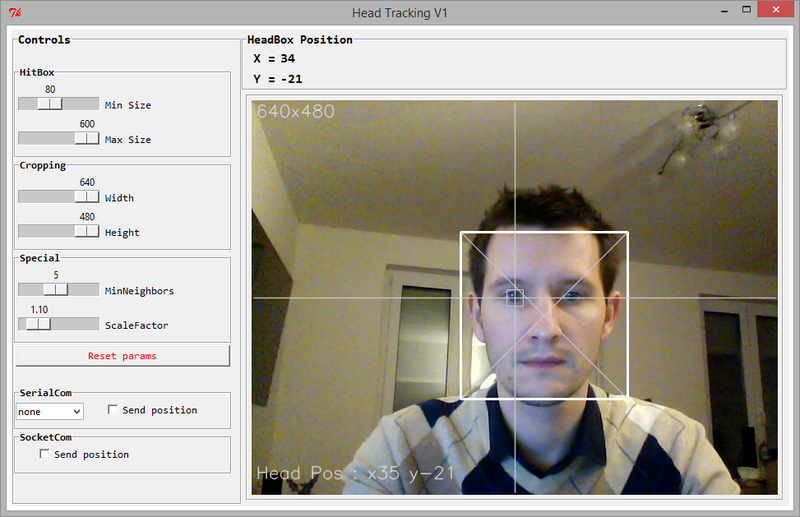 The software is using the standard Face Detection from OpenCV. The interface also allows to change the detection settings (video cropping, Face HitBox size, etc..) These parameters are directly in the GUI so it is easy to find the right settings. I will maybe add a save/load feature for the parameters later if needed. But for now you can tune these parameters in real-time, then change their default values in the code. This application is based on Python 2.7 and OpenCV 3. To use it you need to install the following packages : PIL, tkinter, PySerial and numpy. For now I’m working on windows, so I didn’t tried it on the Pi yet… this means I can’t help you for packages installation… However, I suggest you to install PIP to install packages, this would be much easier. Do not forget to place haarcascade_frontalface_default.xml in the same folder as the Python file. Of course I will not use this application for the Pi as it would be too heavy to process smoothly, I will make a lighter version without GUI and without video feedback and only focus on the algorithm and UART output. Below you can find the application’s code. Please be indulgent as I’m still learning Python… I’m sure it can be greatly improved (if you have corrections/suggestions, please tell me 😉 ) but at least it is as clear as possible and working quite fine ! Normally the code contains enough comments to understand it if you know how to program. But if you have questions, do not hesitate to ask me ! Animabot Rev2 – Final Assembly ! But also because I had to fix several issues in Anima before mounting the legs and the upper body. First I had to fix the sound problem, curiously the IR sensor was generating noise which was propagated up to the audio amplifier, thus generating audible noise… To fix it I added to capacitors (100nF & 10µF) on the sensor’s power connection. Then I burned the Li-ion charger 😦 so I had to replace some mosfet and add some heatsinks. Finally after 20 months of design, tests, doubts, bug fix, etc… Animabot is assembled and ready to walk !!! Hello ! The assembly of Animabot is going well, I have almost finished 🙂 I’m mostly making cables and cables… Thinking about how I’m gonna put all of them into the body… But anyway, I’m also testing the electronic and everything is also fine up to now: Audio amp and speakers, IR telemeter, fan, Night LED, temperature sensor and power monitor and the ATX Raspi are working !!! The Rapsi is also much thinner without all these big connectors 🙂 but I have some issues with the WIFI dongle and I need to test the webcam.